Is this the Times Square of 3015? Move over, off-brand Cookie Monster. The Times Square of the future features mountains, redwoods, a beach and its own stadium. 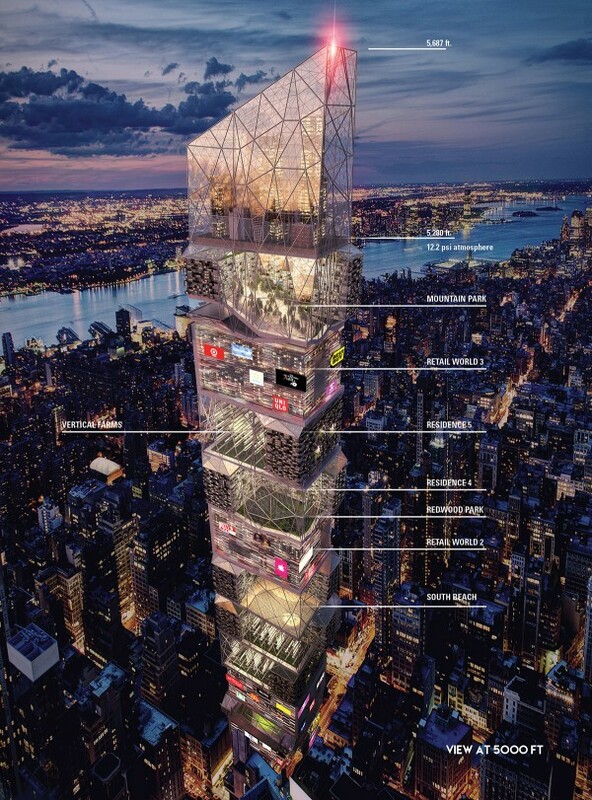 This Honorable Mention from the 2015 eVolo Skyscraper Competition imagines a Times Square where overpopulation necessitates some sci-fi thinking. The submission, titled “Times Squared 3015,” was created by Blake Freitas, Grace Chen and Alexi Kararavokiris. The design capitalizes on the principle that good designers maximize a limited footprint by building up. One of the most exciting innovations is the transportation system, which utilizes a massive central core subway/elevator system. From there, “local” stops can be made using secondary escalators and stairs. A leading architecture and design journal, eVolo explores technological advances, sustainability and innovative design for the 21st Century. Next year’s competition guidelines have yet to be announced, but you can check out more top submissions for 2015’s contest here. What do you envision for the NYC of the future? Tweet @bbhnyc and we might feature your idea in a future story.